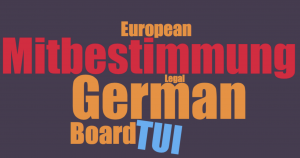 In the last week there was an important decision for the continuity in German boards: The participation of employees in the German Boards is compatible with European Law. so the continuity of the German composition of boards is guaranteed. Since 1965 in Germany are the half of the members of the board sent by employees. The German Konrad Erzberger saw in this very special law a discrimination: Only German employees are able to participate this law. Employees of other countries aren`t represented with this law. With this commencement the petitioner got the wrath of the German unions: They are often financed by the fee, their members got by participating the supervisory board. In that context, EU law does not, in the field of representation and collective defence of the interests of workers in the management or supervisory bodies of a company established under national law, a field which, to date, has not been harmonised or even coordinated at Union level, prevent a Member State from providing that the legislation it has adopted be applicable only to workers employed by establishments located in its national territory, just as it is open to another Member State to rely on a different linking factor for the purposes of the application of its own national legislation. The cooperation with employee representatives in the supervisory boards has proved successful for the majority of specialists and managers in Germany. explained the president Ulrich Goldschmidt. The German participation is a great advantage for the location of Germany and has proven in the past 52 years. Now the European Court has obtained legal certainty.